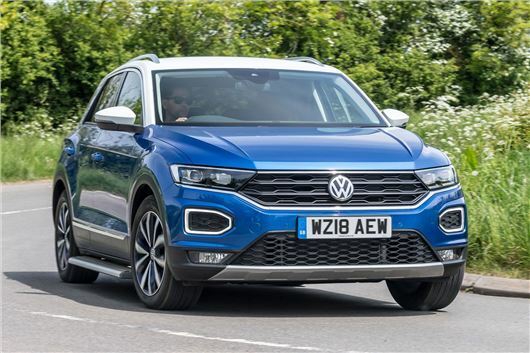 A diesel Volkswagen T-Roc is now more affordable thanks to the introduction of a smaller, more efficient diesel engine. The new 1.6-litre turbodiesel comes with a six-speed manual gearbox and produces 115PS and 250Nm of torque. Although Volkswagen has yet to reveal an official fuel economy figure for the entry-level diesel, it has been tested under the new WLTP lab tests. Volkswagen's quoting an NEDC-derived CO2 emissions figure of 115g/km. Only available as a front-wheel-drive model, buyers after four-wheel drive will have to opt for the 150PS 2.0-litre turbodiesel. Petrol buyers, meanwhile, are catered for with 1.0-, 1.5- and 2.0-litre TSI engines with power outputs ranging from 115PS to 190PS. Prices for the 1.6-litre diesel start at £21,290 for the T-Roc S, rising to £27,010 for the T-Roc R-Line. For comparison, the 2.0-litre diesel starts at £28,850 in SEL guise. The petrol, meanwhile, costs from £18,955. The T-Roc is the latest and cheapest addition to Volkswagen's SUV offensive, although a new model - badged the T-Cross - will sit below the T-Roc when it goes on sale in 2019.